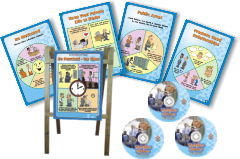 52 Weekly Awareness Posters, 12 Monthly Theme Posters, 12 Basic Good Manners in Workplace Posters. 12 x laminated Posters. 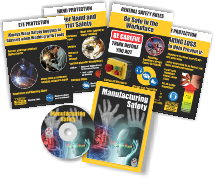 Topics: General Safety Rules, Housekeeping, Unsafe Acts & Conditions, Safe Use of Machines, Colour Coding, Protective Equipment, Safety Signs, Fire Safety. 10 x laminated Posters. Topics: Health & Safety Act, Safety Signs, The Environment, Quality Standards, Code of Conduct. 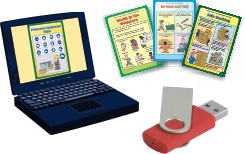 A2 12 Poster Flipchart with folding stand. Topics: General Safety Rules, Housekeeping, Unsafe Acts & Conditions, Safe Use of Machines, Colour Coding, Protective Equipment, Safety Signs, Fire Safety. Digital Posters in JPG Format on a Flash Drive. 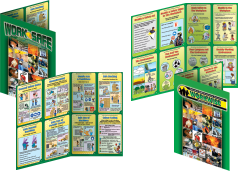 52 Weekly Awareness Posters, 12 Monthly Theme Posters, 12 Basic Good Manners in Workplace Posters. 12 Pocket-sized handouts. 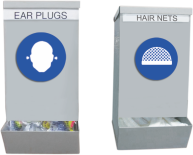 Topics: General Safety Rules, Housekeeping, Unsafe Acts & Conditions, Safe Use of Machines, Colour Coding, Protective Equipment, Safety Signs, Fire Safety. 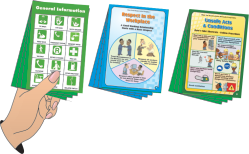 A4 folded Infolets, topics: General Safety Rules, Housekeeping, Unsafe Acts & Conditions, Safe Use of Machines, Colour Coding, Protective Equipment, Safety Signs, Fire Safety, Health & Safety Act, Safety Signs, The Environment, Quality Standards, Code of Conduct. 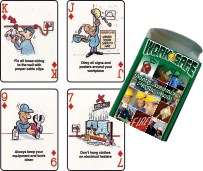 Packs of 52 Playing cards with Worksafe related facts & slogans. 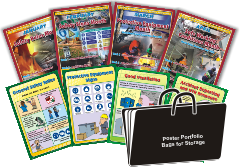 Facilitator’s Manual, 6 x Dvds, 1 Flipchart, 12 laminated Posters, Pocket Posters, A5 Handouts & Powerpoint Presentation. 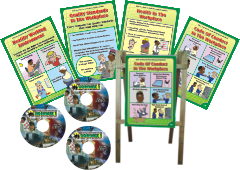 Topics: Health & Safety Act, Safety Signs, The Environment, Quality Standards, Code of Conduct. 4 Dvd’s, 3 Sets of 4 A3 laminated Posters. 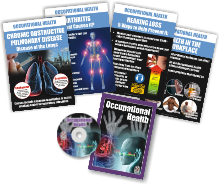 Topics: Hearing Loss, Chronic Obstruction Pulmonary Disease (COPD), Arthritis, Health in Workplace. 3 x Dvds, 3 sets of 8 laminated (21) A2 Posters. 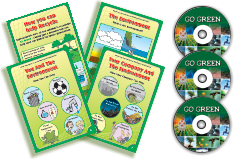 Topics: Carbon Footprint, Industrial Footprint, Personal Footprint. 3 x Dvds, 1 Flipchart, 14 laminated A3 Posters. Topics: Code of Conduct, Conditions of Employment, Industrial Relations, Hygiene, Sexual Harassment, Public Areas, Confidentiality. Digital animated safety posters that can be displayed in caffeteria's and other venues. Topics: General Safety Rules, Housekeeping, Unsafe Acts & Conditions, Safe Use of Machines, Colour Coding, Protective Equipment, Safety Signs, Fire Safety, Health & Safety Act, Safety Signs, The Environment, Quality Standards, Code of Conduct. Copyright (c) 2016 Chapmar Industries. All Rights Reserved.